All good things come to an end an League One leaders Luton lost for the first time in 29 third-tier matches after a devastating second half comeback from Charlton. 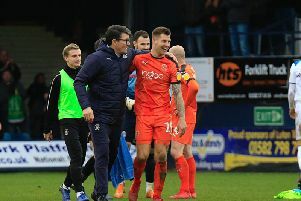 A penalty that Hatters boss Mick Harford labelled a game-changing “disgrace” cancelled out Harry Cornick’s opener before two goals in as many minutes from the Lyle Taylor and Igor Vetokele-inspired Londoners consigned Town to defeat, six months to the day of their last in the league. Even before Andrew Shinnie was given his marching orders late on, it was a humbling experience that also ended an incredible 76-game all-competition streak of going unbeaten after taking the lead. The scene had been set for match number 77 when Cornick pinged Pelly-Ruddock Mpanzu’s through-ball into the top corner on 15 minutes, in his first start since December 29. And they had other chances in the first half. Namely George Moncur, Town’s only other line-up change, almost found the same spot, but for the acrobatics of Dillon Phillips. 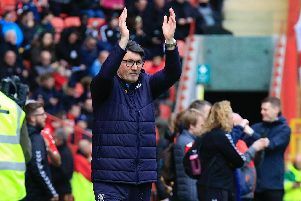 Luton were effective on the counter in the first half, though not without their nervous moments at the other end, as Charlton pressed them like few other teams had managed during their record-breaking run. Keeper James Shea was fortunate to only see yellow after clattering into a shooting Vetokele outside of the box, though the covering Sonny Bradley was likely the reason for the caution instead of a dismissal. And his goal remained charmed, for a time, when Matty Pearson slipped, not for the first time in the contest, and Taylor hit the bar when he should’ve scored. If they were warnings from both home strikers, Luton failed to heed them. Jack Stacey, referee Gavin Ward gave them a gift soon after. Taylor backed into Bradley in the 54th minute, hit the deck and waited for the whistle, which duly blew. Luton players protested to no avail as Taylor nonchalantly converted from 12 yards and Addicks boss Lee Bowyer even admitted afterwards that the decision was “soft”. Town needed to calm the game down at that point but, with The Valley rocking, they could barely get out of their own half. Charlton, to their credit, also ruthlessly punished Luton’s mistakes and Vetokele was the beneficiary, in the 72nd minute, of Town losing possession, sliding the ball beyond an out-rushing Shea. But any hopes of a Hatters rescue act, like the previous game against Blackpool, were quickly decimated two minutes later when Moncur was caught out in his own half and Vetokele put the ball on a plate for Taylor, who gobbled up the cross. Town didn’t fashion a chance of note in response and, to make matters worse, Shinnie was given his marching orders two minutes from time for a second bookable offence, capping off an unfamiliarly sobering afternoon. Yet, five points clear of Barnsley in second with just four games still to go, Luton remain firmly in pole position to claim back-to-back promotions for the first time in the club’s history.